Trying to tidy up the garden a bit yesterday, I decided to put all the old plastic flowerpots we seem to have collected over the years to good use. 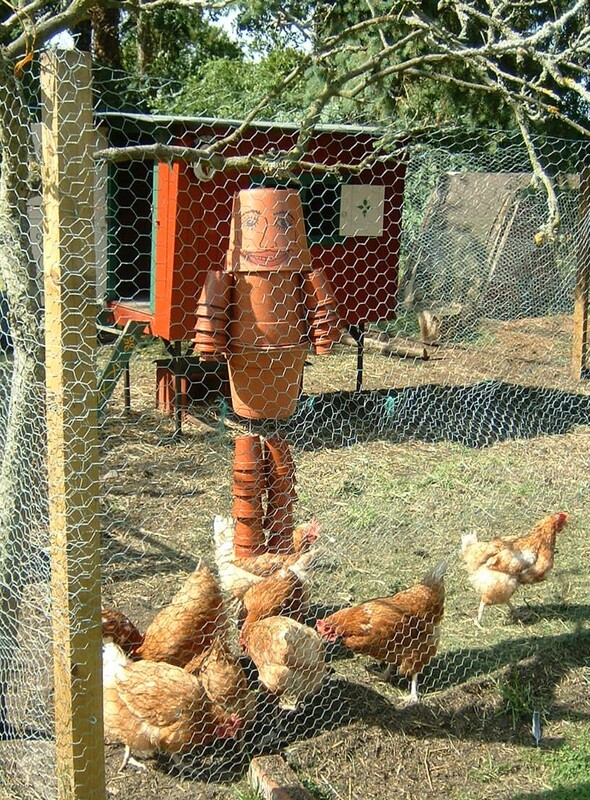 I would make a flower-pot man to hang in the chicken run, thus hopefully scaring away the evil egg-thieving crows, and bringing a little amusement to the garden. Problems began when my husband came to see what I was doing and (after a suitable period of eye-rolling) accepted the task of drawing on the man’s face. Overuse of red marker pen resulted in our pot person definitely being a woman – thus was created Beatrix Pot-her (after much side-splitting laughter…..you kind of had to be there….!). She is now hanging in the hen run (in a rather macabre manner, from a tree!) – and supervised my cleaning out of the hen house this afternoon.